I am constantly trying to eat healthier so one of my goals is to lower salt intake. These tips are great because they are easy and will not alter the taste of your favorite foods and dishes. 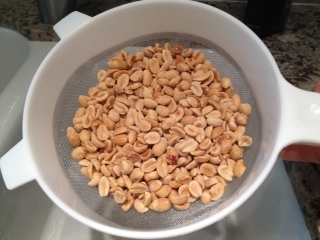 Salted roasted peanuts – Obviously unsalted peanuts would have no salt, but if you love salted peanuts like I do, take out your mesh colander, pour the peanuts in the colander and shake, shake, shake. They will still have plenty of salt, but a whole lot less. The nuts actually taste better because now you taste more of the peanut and less salt. The whole point of adding salt is to enhance the flavor of the food. Your food should never taste salty; if it tastes salty it means the item was over-salted. Olives – Olives have a lot of salt. I remove the pimento and rinse the olive in water. The now salt-free exterior and briny interior are a wonderful contrast which actually brings out the flavor even more. I only rinse the olives I plan to eat at that moment. This works for both green olives and Kalamata olives. Canned vegetables – Fresh vegetables don’t contain any salt so they are the preferred choice to canned. If you have canned vegetables, you don’t need to toss them out. Canned vegetables contain all the nutrients since they are canned at their peak of freshness; the downside is that they are soaking in salt. Rinse the canned vegetables before adding to your recipes. Problem solved! Salt – Use sea salt instead of table salt. Sea salt is courser, larger and has a more pronounced flavor. I leave the salt out of my meals during preparation and just add a tiny sprinkle on top. No one will know the salt content in your dish is lower. You can also remove salt from your body by exercising and eating foods high in potassium. Exercise is great for removing salt. Sweat it out with a heart-pumping cardio workout. Now I’m hungry for sweet potato wedges baked with olive oil and herbs! List of foods with potassium obtained from WebMD.com.